Automated advisor that trades one order with the ability to change the order with the buttons Close, SELL and BUY. Ideal for novice traders, it allows you to safely acquire Forex trading skills. The deposit is protected from significant drawdown and the mode of saving a profitable transaction. In the automatic mode, it uses the author's algorithm for analyzing three indicators and the direction of the market for making a decision to open a transaction. Opens an order with StopLoss and TakeProfit set in accordance with the specified StopLoss and StopProfit. 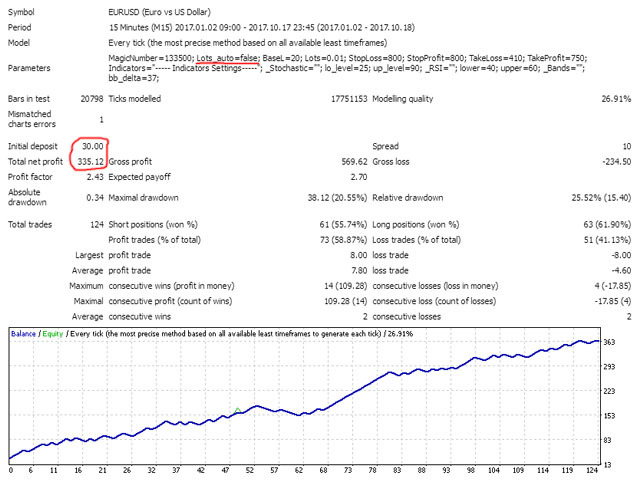 Closes the position by exceeding the specified TakeLoss or TakeProfit parameters. If there is no order opened by him, the adviser analyzes the current opportunity for the transaction. For manual control, the CLOSE, SELL and BUY buttons are displayed on the chart. The advisor remembers the maximum value of the deposit and if the current value is less than the established percentage, SaveDeposit stops trading. The parameters Use EquityStop and Total% Risk to EquityStop enable tracking of the current deposit, closing the order and stopping trading. The mode of saving a profitable trade: The SaveProfit parameter sets a percentage of the value of the TakeProfit parameter. The obtained value is used by the adviser to close the transaction in case of a market reversal. If SaveProfit = 0 mode is not used. The set values of parameters are optimal for trading on EUR / USD M15. The results in the strategy tester for 2017 are shown in the screenshots. Two options for the work of the adviser are given: with a fixed lot and with automatic lot calculation based on the amount of the current deposit. The results of the work of GS Trend adviser on 10/16/2017 on a real account can be seen on the signal: Signal_GS_Trend . His logic for the entrance is pure chance, he enters when he wants and almost always the other way around. It is usually more or less effective because it has an SL of 800, for the price to dance. It takes several days in bearish tendencaia and now it is committed to operate only buy, I mean the other way round. There are other better trend EAs that do not force you to have 800 pips of SL and also up for free. На график выведены кнопки CLOSE, SELL и BUY. 1. Uses the Forex Factory news feed to close the order before the news release and continue working afterwards. Added the Lots_turbo parameter, which works if Lots_auto=true. If Lots_turbo=true, the mode of trading with the maximum possible lot size based on the current deposit is enabled. If Lots_turbo=false, the algorithm of gradual trade volume increase is used. Added the 'trend' parameter, used in the algorithm for determining the price movement direction. The default parameters are set for optimal trading according to the interval between October and December 2017. 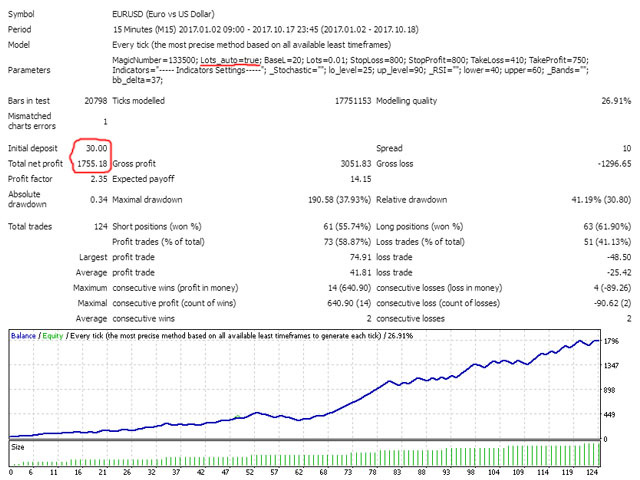 The SaveProfit parameter sets a percentage of the TakeProfit value. The resulting value is used by the EA to close the trade in case of a market reversal. If SaveProfit = 0, this mode is disabled. However, the parameter limits the amount of money that can be withdrawn from the account without stopping the trading. To resume trading it is sufficient to add funds to the deposit.